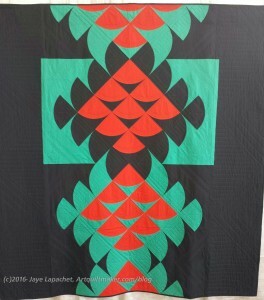 Another quick post to keep you in the QuiltCon loop. Today was our day to look at the rest of the quilts and vendors. There weren’t a ton of vendors (PIQF has more), but the vendors did have interesting stuff and there was lots of free stuff – fat quarters and charm squares. It was kind of fun, but also somewhat overwhelming. First, we looked at quilts. As usual there was a lack of understanding of what the judges were thinking. One I liked was Phoenix by Anne Sullivan of Gaithersburg, Maryland (@playcrafts). 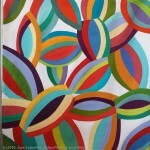 Anne gave a lecture to BAMQG at some point in the not too distant past about color. 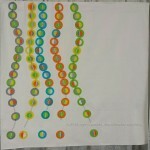 Colorfall by Timna Tarr of South Hadley, MA (@timnatarr) was very interesting. 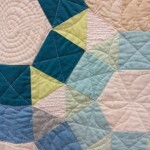 I really liked the quilting on this piece. It did not distract from the overall design and fit in very well. 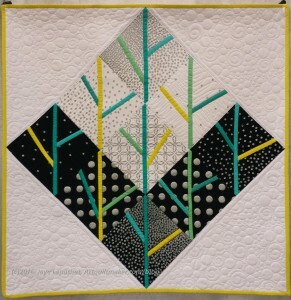 Drip by Suzy Williams, Chicago, IL, (@suzyquilts) was one of my favorites. I think it was because of the colors. I saw it from across the room and it caught my attention. 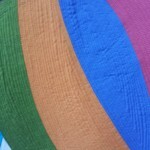 I am dying to make a quilt that invokes such a sense of calm. 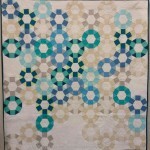 Falling by Kathy York of Austin, TX and the Austin Modern Quilt Guild (@kakiyark) was another favorite. The balance is good. The colors work well together. The design isn’t too fussy or complicated. There is also repetition with variety. That little bit of handwork adds something, but not a lot. I love it and am inspired to make something just as fantastic. I also really liked Cog by Emily Cier (@cpatchwork). 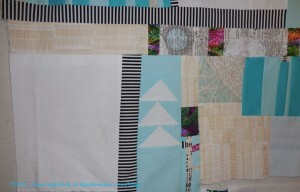 I have always wanted to make a Jack’s Chain quilt. This is the same pattern except in Jack’s Chain the squares are replaced by 9 patches. I love the addition of the trees in Putting on the Glitz by Tami Levin of Sunnyvale, Calif. (@lemontreetami). 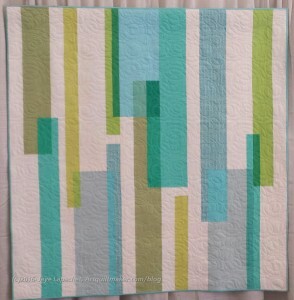 The colors used to imply the trees are perfect on top of the Michael Miller challenge quilts. There were some quilts I wondered about, but there were many, many more quilts that wee really interesting in some way. I did wonder about the size of some of the quilts. 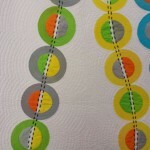 I thought modern quilts were supposed to be utilitarian? The small quilts, unless they were large mug rugs, did not seem to be utilitarian to me. One of the good things about the show is that it wasn’t just about looking at quilts and buying stuff. There were manufacturers there who were not there to sell, but to market their newest lines and concepts. 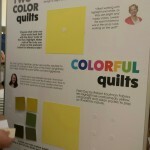 A couple of the manufacturers were also working with attendees to make donation quilts. Kona’s new Color of the Year, Highlight, was the theme of the booth. 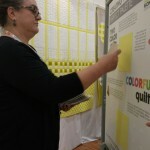 In addition to all the Highlight quilts being shown, they had a color activity where you could design your own palette around Kona’s new Color of the Year. Julie created her own palette and we both received FQs for her trouble. 😉 It might be interesting to work with. Timeless Treasures was making a donation quilt in their Dear Stella booth. 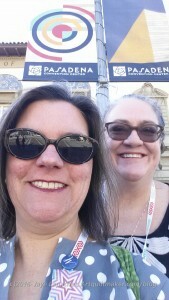 We didn’t have a chance to stop and make a block, but we did take some time to post a selfie so we could possibly win a pack of FQs. I posted the goofy selfie above! Victoria Findlay Wolfe told us about the donation quilt that Marcus Fabrics was making to provide additional funds for ALS research. We needed to sit down for a minute, so we stopped there and made some blocks. 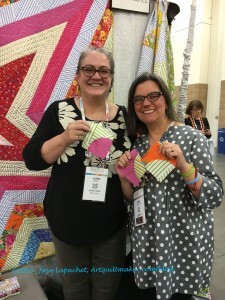 We met a fellow class member from yesterday and chatted with her about her guild, the Omaha Modern Quilt Guild. I made two blocks and we have some pieces from the class that we can use to make more. 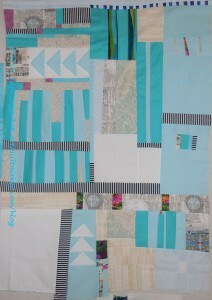 The blocks are hand pieced and I have stuff to make more with me. I hope to find the time to do it. You know how much I support efforts make donation quilts. The fabric is the new Victoria Findlay Wolfe Manor House line. Julie and I bought a layer cake and will share it. Finally we took some time to look at the vendors. There weren’t as many vendors as I expected, though others have said that there are twice as many vendors as last year. 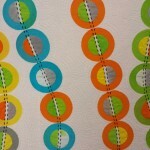 I loved seeing new and interesting fabrics (not the old stuff vendors bring to PIQF) and fun prints. 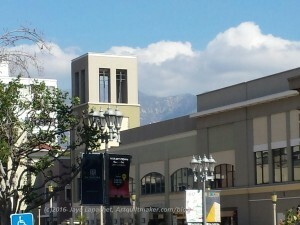 I was also pleased to see Sizzix, Accuquilt, several machine manufacturers and small fabric stores like Crimson Tate. I was thrilled when Coral messaged me asking to meet up. 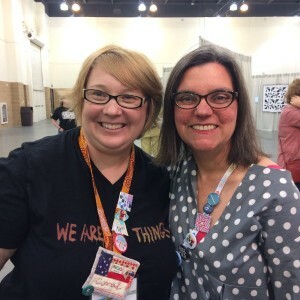 We met at the Marcus booth, because we were still working on our donation blocks. She was a sport in that she was willing to meet us there so we could finish. Coral is a lovely person who is a Bay Area native, but now lives in Canberra. We chatted for a few minutes, then she needed coffee and we needed to get back to our vendors. It is fun to meet people I know from Instagram and Twitter. 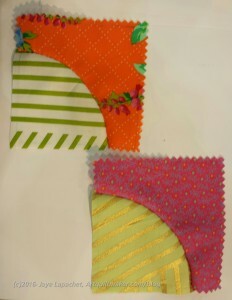 I decided to look for some fabrics that I could mix in with my Timeless Treasures background for the VFW quilt. 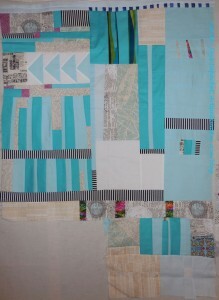 I won’t have enough of the original background and I want to make the design more interesting and the quilt larger. 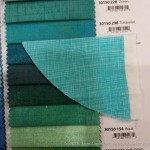 I took a piece of my fabric with me and compared it to various solids that were available. The above were some of the good choices. 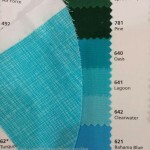 I also want to take a look at Moda Bella Seafoam and Moda Bella Big Chill. They look like they will work. I want the solids to blend, though, and not to stick out too much. It is a difficult problem because the TT fabric I used has a lighter fabric overlaid with a darker fabric. 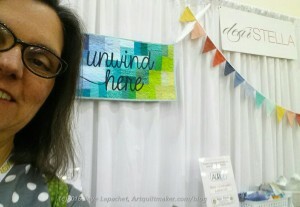 All in all we had a fun time, met some nice people, saw some great products and quilts.